For other uses, see Silent Sam (disambiguation). In storage. Statue toppled by protesters August 20, 2018; plinth and plaques removed January 14, 2019. Beginning in the 1960s, the statue faced opposition on the grounds of its racial message, and it was vandalized several times. Protests and calls to remove the monument reached a higher profile in the late 2010s, and in 2018 UNC Chancellor Carol L. Folt described the monument as detrimental to the university,   and said that she would have the statue removed if not prohibited by state law. Increased protests and vandalism resulted in the university spending $390,000 on security and cleaning for the statue in the 2017-18 academic year. Ours is the task to build a State worthy of all patriotism and heroic deeds, a State that demands justice for herself and all her people, a State sounding with the music of victorious industry, a State whose awakened conscience shall lead the State to evolve from the forces of progress a new social order, with finer development for all conditions and classes of our people. the present generation ... scarcely takes note of what the Confederate soldier meant to the welfare of the Anglo Saxon race during the four years immediately succeeding the war ... Their courage and steadfastness saved the very life of the Anglo Saxon race in the South. Several protests in the late 2010s were directed toward the statue, along with calls for its removal. On August 20, 2017, protestors singing " We Shall Overcome" draped Silent Sam in black,  as had just been proposed for the Charlottesville statues of Robert E. Lee and Stonewall Jackson, whose removal, at least for the moment, had recently been blocked (see Removal of Confederate monuments and memorials#Virginia). At 9:20 p.m., Silent Sam was felled;    the crowd cheered. "People [were] screaming and jumping in disbelief." A newscaster on the scene described the mood as "jubilation". Holding signs and chanting "stand up, fight back" and "This is what democracy looks like", some protesters stomped on the statue and tried to cover it with dirt. During 2017–2018, the UNC Police Department used an undercover police officer to gain information on the activities of campaigners against Silent Sam. This was discovered on November 2, 2017  when students saw the former "auto mechanic" in police uniform. The Police Department has confirmed this and defended what they did as "intelligence gathering". The use of an undercover officer was bitterly resented by some Silent Sam protestors, and was brought up repeatedly during later protests. Adam Domby, historian of the Civil War, Reconstruction, and the American South, with a Ph.D. in history from UNC at Chapel Hill: "I think ultimately what really did this (toppling) is the Heritage laws were really undemocratic.... They're taking away any recourse for communities who want to remove a monument." It was Domby who unearthed the Carr speech (see above). However, there is a procedure to petition the historical society for removal of monuments. As of August 23, 2018, Silent Sam is being kept in an undisclosed location because of safety concerns. 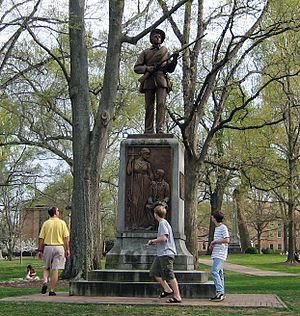 Prominent placement of the Silent Sam monument at McCorkle Place in downtown Chapel Hill is an offense to the entire Chapel Hill community, including African-American students, faculty members, university employees, local residents, and business persons who call Chapel Hill home, as well as to returning alumni and the countless fans and tourists who visit our Town every year. To them and to us, Silent Sam and its roots in pro-slavery, pro-segregation ideology represent the antithesis of the high value that UNC and the Town of Chapel Hill place on being a welcoming and inclusive place for all. Archival material on Julian Carr is in Special Collections, University of North Carolina at Chapel Hill Library. Much has been digitized and is available online. ^ a b The inscriptions are in all capital letters but are rendered here in sentence case for ease of reading. ^ Svrluga, Susan (Sep 5, 2018). "Hundreds of UNC faculty members urge officials not to restore Silent Sam statue to its original location". Washington Post. ^ a b Killgrove, Kristina (August 22, 2018). "Scholars Explain The Racist History Of UNC's Silent Sam Statue". Forbes. ^ a b c d e f g h Farzan, Antonia Noori (August 21, 2018). "'Silent Sam': A racist Jim Crow-era speech inspired UNC students to topple a Confederate monument on campus". The Washington Post. Retrieved August 21, 2018. ^ a b Green, Hilary N. "Transcription: Julian Carr's Speech at the Dedication of Silent Sam". people.ua.edu. University of Alabama. ^ Johnson, Kimberly (August 24, 2018). "'Silent Sam' Confederate Statue To Be Reinstalled: UNC Official". Charlotte Patch. ^ a b "Governor Craig's Address" (PDF). Raleigh News and Observer. 3 June 1913 – via University Archives at UNC Chapel Hill. ^ Venable, Frances P. "Folder 128: Speeches and Essays on Education: Scan 1". Southern Historical Collection, The Wilson Library. University of North Carolina at Chapel Hill. ^ Venable, Frances P. "Folder 128: Speeches and Essays on Education: Scan 2". Southern Historical Collection, The Wilson Library. University of North Carolina at Chapel Hill. ^ "[Mary Lyde Williams' speech at the dedication of Confederate Monument]" (PDF). Morning Star. Wilmington, NC. 15 June 1913. ^ a b c "FADELESS GLORY OF BRAVE YOUNG BLOOD: Monument to University's Soldier Sons Unveiled at Chapel Hill. LOVE'S GIFT TO VALOR: Women of State Raise Statue to Youthful Chivalry. Governor Pays Tribute Carolina Manhood". Charlotte Observer. Charlotte, NC. June 3, 1913. pp. 1–3. Retrieved 28 August 2018 – via GenealogyBank. ^ Leonard, Teresa (June 1, 2015). "UNC's Silent Sam statue was unveiled in 1913 ceremony". The News & Observer. ^ a b c d e f Warren-Hicks, Colin (August 23, 2017). "A Look at the Long and Controversial Life of 'Silent Sam'". The News & Observer. ^ a b Bonner, Lynn (July 3, 2018). "National group's anti-Silent Sam billboards aim to spur statue's removal". News & Observer. ^ a b c d e Stancill, Jane (August 23, 2018). "UNC will 'do everything in our power' to ensure safety, chancellor says". The News & Observer. Retrieved August 24, 2018. ^ a b "'Silent Sam' torn down during protests at UNC". WNCN. August 20, 2018. Retrieved August 20, 2018. ^ a b Jacobs, Julia; Blinder, Alan (August 31, 2018). "University of North Carolina Chancellor Explores New Spot for 'Silent Sam'". New York Times. ^ Carol L. Folt (August 31, 2018). "Message from Chancellor Folt on the future of the Confederate Monument". UNC at Chapel Hill. Retrieved Oct 5, 2018. ^ Stancill, Jane (December 3, 2018). "UNC officials recommend new building on campus just for Silent Sam". News & Observer. ^ Svrluga, Susan (December 3, 2018). "Silent Sam should stay on UNC campus in safer location, university leaders suggest". Washington Post. ^ Board of Trustees and Chancelor of the University of North Carolina at Chapel Hill (December 4, 2018). "Recommendation for the Disposition and Preservation of the Confederate Monument. A Four-Part Plan presented by UNC-Chapel Hill to the UNC Board of Governors" (PDF). ^ Stancill, Jane; Grubb, Tammy (December 14, 2018). "'Back to the drawing board' — UNC board rejects latest Silent Sam plan. New panel launched". News & Observer. ^ Quillin, Martha (March 5, 2019). "Silent Sam's fate is put on hold again. Committee has more time to decide about monument". News & Observer. Retrieved April 8, 2019. ^ Eucker, Ava (November 29, 2018). "Student-produced documentary on Silent Sam asks UNC, 'Who are you really for?'". Daily Tar Heel. ^ a b c d e United Daughters of the Confederacy, North Carolina Division (1910). Minutes of the 14th annual convention of the United Daughters of the Confederacy: North Carolina Division. Minutes of the ... annual convention of the United Daughters of the Confederacy: [serial] North Carolina Division. Newton, North Carolina: Capital Printing Co. p. 66 – via Internet Archive. ^ "In Memorial to Carolina's War Dead". Carolina Alumni Review. UNC General Alumni Association. April 25, 2007. ^ a b "A Nursery of Patriotism: the University at War, 1861-1945—Civil War—Conscription". UNC University Library Exhibits. University Archives at UNC Chapel Hill. November 13, 2007. ^ "Interactive Tour: Confederate Monument". The University of North Carolina at Chapel Hill. Archived from the original on November 23, 2016. Retrieved August 21, 2018. ^ United Daughters of the Confederacy, North Carolina Division (1906). Minutes of the 11th annual convention of the United Daughters of the Confederacy: North Carolina Division. Minutes of the ... annual convention of the United Daughters of the Confederacy: [serial] North Carolina Division. Newton, North Carolina: Enterprise Print. p. 71 – via Internet Archive. ^ a b c d e "A guide to resources about UNC's Confederate monument: Timeline". UNC University Library Exhibits. University Archives at UNC Chapel Hill. 2016. ^ "CPI Inflation Calculator". U.S. Bureau of Labor Statistics. ^ a b c Gutierrez, Michael Keenan (July 7, 2015). "UNC's Silent Sam and Honoring the Confederacy". We're History. Retrieved January 26, 2016. ^ a b c d "A guide to resources about UNC's Confederate monument: Archival Resources". UNC University Library Exhibits. University Archives at UNC Chapel Hill. 2016. ^ "Silent Sam (Civil War Monument)". The University of North Carolina at Chapel Hill Virtual Tour. Archived from the original on February 13, 2013. Retrieved March 1, 2008. ^ Carola, Chris (April 18, 2015). "Civil War 'Silent Sentinels' still on guard in North, South". Associated Press. ^ "Confederate Monument (a.k.a. Silent Sam)". The Carolina Story: A Virtual Museum of University History. Archived from the original on February 2, 2016. Retrieved April 23, 2018. ^ "Confederate Monument, UNC (Chapel Hill)". Documenting the American South: Commemorative Landscapes of North Carolina. University Library, University of North Carolina at Chapel Hill. 2010-03-19. ^ Heuston, Sean (November 2014). "The Most Famous Thing Robert E. Lee Never Said: Duty, Forgery and Cultural Amnesia". Journal of American Studies. 14 (4). doi: 10.1017/S0021875814001315. ^ a b "The Soldiers' Monument Unveiled". The Alumni Review. 1 (6). June 1913. pp. 184–185. ^ "'Silent Sam' a Yankee". Carolina Alumni Review. January 1975. p. 6. As a model for the musket-carrying soldier, he used a young man from Boston, Harold V. Langlois. ^ University of North Carolina, Louis Round Wilson Special Collections Library. "Julian Shakespeare Carr Papers, 1892-1923. Series 2. Sunday School Lessons and Addresses, 1896-1923 and undated. Folder 26: Addresses, 1912-1914: Scan 104". ^ a b c Brundage, W. Fitzhugh (August 18, 2017). "I've studied the history of Confederate memorials. Here's what to do about them". Vox. Retrieved August 21, 2018. ^ "Soldiers' Monument. Chapel Hill, N.C. (photograph)". North Carolina Collection Photographic Archives, Wilson Library, University of North Carolina at Chapel Hill. Retrieved September 22, 2018. ^ "Confederate Monument and students in uniform, 1918 (photograph)". The Carolina Story: A Virtual Museum of University History, University of North Carolina at Chapel Hill. Retrieved September 22, 2018. ^ Jennings, Louise (April 9, 1968). "Silent Sam's Dignity Restored". Daily Tar Heel. Retrieved August 28, 2018. ^ "Graffiti on 'Silent Sam' (photograph)". Hugh Morton Collection of Photographs and Films, University of North Carolina at Chapel Hill, Wilson Library. April 1968. Retrieved September 22, 2018. ^ "Spring cleaning for 'Sam'". The Alumni Report. 28 (3). May 1981. p. 1. ^ "Silent Sam's on sabbatical". Carolina Alumni Review. Summer 1986. p. 2. ^ "Confederate Monument". UNC The Graduate School. Retrieved August 21, 2018. ^ Palmer, Emily (November–December 2011). "As Time Goes By Sam Seems to Get Noisier". Carolina Alumni Review. pp. 10–11. Retrieved September 22, 2018. ^ College of Charleston (2016). "Adam Domby". Retrieved September 9, 2018. ^ "Real Silent Sam movement holds protest focused on statue's history". Daily Tar Heel. September 18, 2011. Retrieved September 22, 2018. ^ a b "NC NAACP President To Speak At Silent Sam 100th Anniversary Sunday". Chapelboro ( WCHL). June 2, 2013. ^ Mazza, Ed (July 6, 2015). "'Silent Sam' Confederate Statue At UNC Vandalized". The Huffington Post. Retrieved April 23, 2018. ^ Lamm, Stephanie (July 9, 2015). "Narratives about Silent Sam collide". The Daily Tar Heel. Retrieved August 21, 2018. ^ Palmer, Emily (November–December 2011). "As Time Goes By, Sam Seems To Get Noisier". Carolina Alumni Review. pp. 10–11. ^ a b Hodge, Blake (August 18, 2015). ""Who is Sandra Bland?" Spray Painted on Silent Sam and Post Office". Chapelboro ( WCHL). Retrieved September 19, 2018. ^ "Confederate statue on UNC-CH campus vandalized again". WRAL-TV. August 18, 2015. Retrieved September 20, 2018. ^ Hodge, Blake (September 10, 2015). "Silent Sam Blindfolded". Chapelboro ( WCHL). Retrieved September 19, 2018. ^ "Pro-Confederate Rally Coming To UNC Campus Sunday". Chapelboro ( WCHL). October 20, 2015. Retrieved September 18, 2018. ^ Keck, Aaron (October 26, 2015). "Demonstrators Gather To Support, And Oppose, Silent Sam". 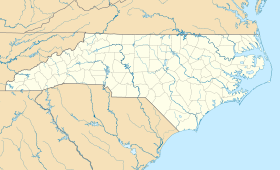 Chapelboro ( WCHL). Retrieved September 18, 2018. ^ "Objections to 'Silent Sam' disrupt UNC University Day". WRAL-TV. October 12, 2015. Retrieved September 20, 2018. ^ "Man Arrested for Spray-Painting Silent Sam". Chapelboro ( WCHL). January 15, 2016. Retrieved September 18, 2018. ^ a b c Drew, Jonathan (August 23, 2017). "Hundreds protest on UNC campus against Confederate statue". The Associated Press. Archived from the original on 2017-09-05. Retrieved August 24, 2017. ^ a b c d e f Grubb, Tammy; Stancill, Jane; Brosseau, Carli (August 21, 2018). "Hands off? Police response to two Silent Sam protests were far different". News & Observer. ^ a b Stancill, Jane (February 28, 2018). "Would UNC faculty actually tear down Silent Sam?". News & Observer. ^ Webster, Hannah (August 18, 2017). "Chapel Hill mayor asks for Silent Sam to be removed from UNC campus". WRAL-TV. ^ Long, Travis (August 22, 2017). "Demonstrators drape 'Silent Sam' in black hood following Charlottesville violence (video)". In Stancill, Jane (ed.). UNC braces for Silent Sam Rally. Herald Sun. ^ a b c d Stancill, Jane (August 22, 2017). "UNC campus braces for Silent Sam rally". News & Observer. ^ Stancill, Jane (August 21, 2017). "Cooper tells UNC leaders they can remove Silent Sam if there's 'imminent threat'". News & Observer. ^ Stancill, Jane; Gronberg, Ray (August 22, 2017). "'Tear it down': Protesters gather at Silent Sam statue on UNC campus". News & Observer. ^ a b c Stancill, Jane; Carter, Andrew (July 12, 2018). "UNC details security costs near Silent Sam for the last year". News and Observer. ^ Moore, Jeff (August 22, 2017). "Gov. Cooper gives UNC green light to remove 'Silent Sam', UNC holds off, citing 2015 law". North State Journal. ^ a b Stancill, Jane (September 7, 2017). "UNC board members criticize leaders' handling of Silent Sam statue". News & Observer. ^ a b c Stancill, Jane (September 6, 2017). "Noisy protest of Silent Sam statue targets chancellor". News & Observer. ^ a b c Chason, Rachel (August 22, 2017). "After Duke incident, rival UNC considers whether to remove Confederate statue". Washington Post. Retrieved November 24, 2017. ^ Effron, Seth (August 29, 2017). "AG Stein wants Confederate monuments down or moved; awaits request for advisory opinion on law". WRAL-TV. Retrieved August 23, 2018. ^ Drew, Jonathan (2017-08-22). "Hundreds protest on UNC campus against Confederate statue". The Washington Post. Archived from the original on 2017-08-24. Retrieved 2017-08-29. ^ a b Strong, Ted (August 25, 2017). "Top lawmaker says no plans to change NC law protecting Confederate monuments". WNCN. Archived from the original on 2017-08-26. ^ a b Debruyn, Jason; Baier, Elizabeth, and Associated Press (August 22, 2018). "NC Historical Commission Agrees To Keep 3 Confederate Monuments On Capitol Grounds, Reinterpret Them". WUNC-TV. Retrieved September 22, 2018. ^ a b c Patel, Vimal (September 25, 2018). "UNC's Chancellor Is a Consensus Builder. Silent Sam Is Her Greatest Test". Chronicle of Higher Education. ^ a b Hodge, Blake (December 15, 2017). "More UNC Faculty Join Call to Remove Silent Sam". Chapelboro ( WCHL). Retrieved September 18, 2018. ^ "UNC student arrested after hundreds protest at UNC-Chapel Hill Silent Sam monument". WRAL-TV. August 22, 2017. ^ Galinsky, Michael (2017). Silent Sam. Rumur. Retrieved December 6, 2018. ^ Hodge, Blake (August 29, 2017). "UNC Chancellor Emeritus: Leaving Silent Sam in Place is 'Untenable'". Chapelboro ( WCHL). Retrieved September 18, 2018. ^ Wall, Julia (September 7, 2017). "Demonstrators loudly urge Chancellor Folt to take down Silent Sam during protest in September (video)". In Stancill, Jane (ed.). "UNC board members criticize leaders' handling of Silent Sam statue". News & Observer. Students and activists gathered outside South Building on UNC's Campus in September with drums, pots and pans, and noise makers to disrupt business as usual and demand that Chancellor Folt take down Silent Sam. ^ Hodge, Blake (September 21, 2017). "UNC Choosing Not to Bring Silent Sam Petition to NC Historical Commission on Friday". Chapelboro ( WCHL). Retrieved September 18, 2018. ^ 35 School of Law professors (October 26, 2017). "Undersigned Faculty Statement on Silent Sam". UNC-CH School of Law. Retrieved September 21, 2018. ^ a b Hodge, Blake (May 1, 2018). "UNC Grad Student Charged with Defacing Silent Sam". Chapelboro ( WCHL). Retrieved September 18, 2018. ^ Gronberg, Ray (November 7, 2017). "That 'auto mechanic' at the Silent Sam protests wasn't a mechanic, activists discover". Herald-Sun. ^ Gronberg, Ray (November 9, 2017). "Violence at Silent Sam? UNC invokes risk in defending use of undercover cop". Herald Sun. ^ Hodge, Blake (November 15, 2017). "Protesters Rally Against UNC's Silent Sam". Chapelboro ( WCHL). Retrieved September 18, 2018. ^ UNC-CH Department of Communication (November 9, 2017). "Statement on Silent Sam". ^ Hodge, Blake (November 9, 2017). "Another UNC Department Calls for Removal of Silent Sam". Chapelboro ( WCHL). Retrieved September 18, 2018. ^ Hodge, Blake (November 28, 2018). "UNC Education Faculty Join Voices Calling for Removal of Silent Sam". Chapelboro ( WCHL). Retrieved September 18, 2018. ^ Irizarry, Ana (February 25, 2018). "Anonymous faculty group threatens to take down Silent Sam". Daily Tar Heel. ^ "Anonymous group calls for removal of UNC's 'Silent Sam'". WRAL-TV. February 26, 2018. ^ Cole, Kiana (February 28, 2018). "What we know about the anonymous faculty demanding Silent Sam's removal". Daily Tar Heel. ^ Blake, Suzanne (May 1, 2018). "We talked to Maya Little about protesting Silent Sam and her arrest Monday". Daily Tar Heel. ^ Siddiqui, Samee (June 14, 2018). "Silent Sam, the Confederate statue at UNC-Chapel Hill, was doused with blood and red ink by protester Maya Little, Monday, April 30, 2018 (video)". In Stancill, Jane (ed.). UNC braces for Silent Sam Rally. News & Observer. ^ Michaels, Will (May 9, 2018). "Silent Sam Protester: 'Eventually, These Statues Are Going To Come Down'". WUNC. Retrieved September 22, 2018. ^ a b c d Stancill, Jane (June 14, 2018). "Silent Sam protester faces honor court charge at UNC". News & Observer. ^ a b Drew, Jonathan (October 15, 2018). "Judge declines to punish student who poured ink on statue". Miami Herald. ^ Hodge, Blake (May 3, 2018). "UNC History Faculty Supporting Student Charged with Defacing Silent Sam". Chapelboro ( WCHL). Retrieved September 18, 2018. ^ Brown, Joel (July 3, 2017). "National group joins fight over Silent Sam, buying Raleigh billboards". WTVD. ^ Holloway, Kali (August 8, 2018). "Activists Boosted by Make It Right Project Posters to Remove 'Silent Sam' Confederate Monument". Independent Media Institute. ^ North Carolina Department of Natural and Cultural Resources (August 15, 2018). "Confederate Monuments Study Committee and N.C. Historical Commission to Meet Aug. 22 in Raleigh". Retrieved September 20, 2018. ^ Stancill, Jane (March 28, 2018). "UNC leaders hope new signs will put Silent Sam's history in context". News & Observer. ^ Ward, Myah; McGee, Charlie (August 20, 2018). "Silent Sam toppled in protest the night before classes begin". Daily Tar Heel. ^ Meet Maya Little, UNC Student Whose Protest Ignited the Movement to Topple a Racist Confederate Statue. Democracy Now!. August 22, 2018. Retrieved December 6, 2018. ^ a b Dukes, Tyler (September 15, 2018). "UNC officials watched protesters closely as Silent Sam fell, texts show". WRAL-TV. ^ a b c d e Stancill, Jane (August 20, 2018). "Protesters topple Silent Sam Confederate statue at UNC". News & Observer. Retrieved August 22, 2018. ^ Blinder, Alan (August 21, 2018). "Protesters Down Confederate Monument 'Silent Sam' at University of North Carolina". The New York Times. Retrieved August 21, 2018. ^ a b c d "'Silent Sam' is down: Protesters topple Confederate statue on UNC campus". WRAL-TV. August 20, 2018. Retrieved August 20, 2018. ^ a b c Travis, Kari (Aug 28, 2018). "What to do with Silent Sam? UNC Board of Trustees will present plan by Nov. 15". Carolina Journal. ^ a b "US students topple Confederate monument". BBC News. 2018-08-21. Retrieved 2018-08-21. ^ DeWitt, Dave; Stasio, Frank (August 21, 2018). "A Towering Legacy To The Confederacy Topples". The State of Things. ^ a b Chapin, Josh (August 20, 2018). "Protesters knock down Silent Sam statue, which had stood on UNC campus since 1913". WTVD. Retrieved August 20, 2018. ^ a b Drew, Jonathan (August 20, 2018). "Confederate Statue on UNC Campus Toppled by Protesters". The Associated Press. Archived from the original on 2018-08-21. Retrieved August 20, 2018. ^ a b c d e Stancill, Jane; Bonner, Lynn; Specht, Paul A. (August 22, 2018). "Police response to Silent Sam protest will be reviewed, UNC board chairman says". News & Observer. ^ a b Molina, Camila; Brosseau, Carli; Grubb, Tammy (September 9, 2018). "Police 'broke the peace' at UNC's Silent Sam protest, say 8 who were arrested". News & Observer. ^ MyFox8 web staff (August 30, 2018). "Chapel Hill braces for possible protest Thursday 10 days after Silent Sam toppled". WGHP (MyFox8). Retrieved November 15, 2018. ^ University Communications (August 24, 2018). "Message from Carolina on possible rally". Retrieved August 25, 2018. ^ Johnson, Joe; Grubb, Tammy; Stancill, Jane (August 25, 2018). "Protesters clash at UNC-Chapel Hill, less than a week after Silent Sam was toppled". Herald-Sun. ^ Associated Press (September 8, 2018). "Eight arrested at protest over North Carolina Confederate monument". The Guardian. ^ Johnson, Joe (September 11, 2018). "Supporters of Silent Sam were greatly outnumbered by the counter protesters". News & Observer. ^ Waggoner, Martha; Drew, Jonathan (August 21, 2018). "Confederate toppling looms over debate about other statues". Associated Press. ^ "UNC System issues statement on Silent Sam toppling: 'We do not support lawlessness'". ABC 11 Eyewitness News. August 11, 2018. Retrieved October 30, 2018. ^ a b Hodge, Blake (August 22, 2018). "SBI Assisting Silent Sam Investigation Amid Questions of Policing Tactics". Chapelboro ( WCHL). Retrieved September 22, 2018. ^ Stancill, Jane (Oct 12, 2018). "UNC leader apologizes for slavery and says school will 'right the wrongs of history'". News & Observer. ^ Quiroz Guttierez, Marco (August 30, 2018). "Those arrested at Silent Sam protests receive charges in a crowded courthouse". Daily Tar Heel. ^ a b Grubb, Tammy; Stancill, Jane (Sep 20, 2018). "Two Silent Sam protesters resolve assault charges stemming from UNC rally". News & Observer. ^ Charles, Alfred (September 5, 2018). "UNC-CH professor facing assault charge from night Silent Sam was toppled". WRAL. ^ a b Johnson, Joe (September 11, 2018). "Crowd comes to talk Silent Sam protests and police, but not with the chief". News & Observer. ^ Grubb, Tammy (October 9, 2018). "Attorney compares those charged in UNC's Silent Sam protests to civil rights 'heroes'". News & Observer. ^ Gronberg, Ray (November 7, 2017). "That 'auto mechanic' at the Silent Sam protests wasn't a mechanic, activists discover". News & Observer. ^ Romer, Ligaiya (November 2018). "Silence Sam (FINE 11/18)". Vimeo. ^ a b Grubb, Tammy; Brosseau, Carli (September 5, 2018). "Residents ask Chapel Hill to review Greensboro police actions at Silent Sam protest". News & Observer. ^ McGee, Charlie; Vizcaino, Maria Elena (September 13, 2018). "'Somebody is going to die': Community weighs in on police conduct at protests". Daily Tar Heel. Retrieved September 23, 2018. ^ Hodge, Blake (September 21, 2018). "Silent Sam Opponents Protest Police Brutality on UNC Campus". Chapelboro ( WCHL). Retrieved September 23, 2018. ^ "Our Opinion: Silent Sam falls victim to spread of campus chaos". Wilson Times. August 21, 2018. ^ Drew, Jonathan (August 23, 2018). "Hundreds protest on UNC campus against 'Silent Sam' Confederate statue". Wilson Times. ^ Specht, Paul A. (August 23, 2018). "GOP lawmaker fears 'civil war' after Silent Sam toppled". Herald-Sun. ^ a b c d Editorial Board (August 23, 2018). "Mob rule at Silent Sam? No, it was something far better different". Charlotte Observer. ^ Waggoner, Martha; Robertson, Gary D. (August 22, 2018). "Panel: Rebel monuments stay on Capitol grounds". WLOS. Retrieved September 25, 2018. ^ "Governor's Office Statement on Silent Sam". North Carolina Office of the Governor. August 20, 2018. Retrieved August 23, 2018. ^ Cooper, Roy (August 15, 2017). "North Carolina Monuments". Medium. ^ Molina, Camila (Aug 27, 2018). "Move Confederate monuments from public places, NC Influencers say". News & Observer. ^ Associated Press (August 22, 2018). "Governor: Change Law on Moving Rebel Monuments". U.S. News & World Report. ^ a b Smoot, Ryan (August 22, 2018). "Local, state leaders react to Silent Sam's removal". Daily Tar Heel. ^ Stancill, Jane (September 11, 2018). "Poll: Majority of NC voters disapprove of toppling of Silent Sam". News & Observer. ^ Molina, Camila (August 27, 2018). "Move Confederate monuments from public places, NC Influencers say". News & Observer. ^ Stancill, Jane (December 6, 2018). "Put Silent Sam back. Send it to a farm. Dump it in a hog lagoon. — UNC's mail ran the gamut". News & Observer. ^ Ward, Myah (September 12, 2018). "Folt, McCracken receive dozens of emails and voicemails after toppling of Silent Sam". Daily Tar Heel. ^ Johnson, Anna (November 11, 2018). "This plane flew a Confederate flag over UNC. 'ALL Veterans Matter,' organizer says". Durham Herald. ^ Editorial Board (August 21, 2018). "Our view: 'Silent Sam' had to go". Winston-Salem Journal. ^ Fayetteville Observer Editorial Board (August 21, 2018). "Our View: Let Silent Sam's legacy be solutions". Fayetteville Observer. ^ Pitts, Myron B. (August 28, 2018). "It was past time to remove UNC's Silent Sam". Fayetteville Observer. I saw on the news Silent Sam face down in the turf at my alma mater, the University of North Carolina. He's never looked better. ^ Daily Tar Heel Editorial Board (October 17, 2018). "Enough with the empty gestures surrounding Silent Sam". Daily Tar Heel. ^ Technician (August 23, 2018). "EDITORIAL: UNC students were right to remove Silent Sam". Daily Tar Heel. ^ Washington Post Editorial Board (August 24, 2018). "North Carolina refused to act on Confederate statues. So protesters did". Washington Post. ^ Stancill, Jane; Bonner, Lynn (August 21, 2018). "UNC system officials and state leaders on Silent Sam: 'Mob rule' won't be tolerated". News & Observer. ^ a b c d McClennan, Hannah; Weber, Jared; Ward, Myah (August 23, 2018). "Chancellor Folt holds Silent Sam press conference, BOG members speak out". Daily Tar Heel. ^ "UNC faculty: Where is leadership on Silent Sam issue?". News & Observer. August 23, 2018. Retrieved August 24, 2018. ^ Shaw, Theodore M. (September 7, 2018). "UNC Center for Civil Rights Director Theodore M. Shaw Statement on Removal of Statue Known as Silent Sam". Center for Civil Rights, University of North Carolina School of Law. Retrieved September 22, 2018. ^ Glatthaar, Joseph T. (August 26, 2018). "Silent Sam from a historian's perspective". Daily Tar Heel. ^ Stancill, Jane; Carter, Andrew (August 25, 2018). "The unfinished story of Silent Sam, from 'Soldier Boy' to fallen symbol of a painful past". Charlotte Observer. ^ Rimer, Barbara K. (August 22, 2018). "Toppling of the Silent Sam statue". Gillings School of Global Public Health, University of North Carolina at Chapel Hill. Retrieved August 25, 2018. ^ Vaden, Ted (Oct 11, 2018). "Former UNC chancellor says he wished he'd taken down Silent Sam". News & Observer. ^ Grubb, Tammy (Aug 30, 2018). "Former UNC chancellor's granddaughter among 14 now charged in Silent Sam protests". Herald-Sun. Retrieved 2018-10-20. ^ Kytle, Ethan J.; Roberts, Blain (2018). Denmark Vesey's Garden: Slavery and Memory in the Cradle of the Confederacy. New York: The New Press. ISBN 978-1-6209-7365-3. ^ Behre, Robert (August 26, 2018). "Behind 'Silent Sam's' toppling at UNC, a lesson for South Carolina, historians say". Post and Courier. ^ Ferrell, Velma (September 2, 2018). "Time to Act". News & Observer. ^ Holloway, Kali (August 22, 2018). "Make It Right Project Responds to the North Carolina Historical Commission Vote to Keep Confederate Monuments Standing". Independent Media Institute. Retrieved October 3, 2018. ^ a b Travis, Kari (October 3, 2018). "UNC Chapel Hill's handling of Silent Sam could be election issue". Carolina Journal. ^ Lubbers, Payne (October 17, 2018). "Former UNC chancellor opposes returning Silent Sam to pedestal". Daily Tar Heel. ^ Folt, Carol (November 9, 2018). "Message from Chancellor Carol L. Folt on the Confederate Monument". Retrieved November 15, 2018. ^ a b c Stancill, Jane (September 5, 2018). "UNC fundraising leaders say Silent Sam threatens safety, reputation of university". News & Observer. ^ Nelson, Aaron; Landess, Elinor (August 30, 2018). "Chamber says Chapel Hill's reputation, economy at stake as Silent Sam protests mount". News & Observer. ^ Stancill, Jane (September 4, 2018). "UNC library board says Silent Sam doesn't belong in Wilson or any of its libraries". News & Observer. ^ Forte, Evely (October 28, 2018). "Almost half of UNC Libraries staff signed statement against Silent Sam being placed in any branch". Daily Tar Heel. ^ 41 department chairs in the UNC-CH College of Arts and Sciences (August 28, 2018). "Letter to Chancellor Carol Folt". ^ "Clergy say returning Silent Sam to same spot would affirm white supremacy". The Herald Sun. September 5, 2018. Retrieved November 12, 2018. ^ Schultz, MarK (September 21, 2018). "Town to UNC: Silent Sam, an 'offense to entire Chapel Hill community,' must be moved". News & Observer. ^ 59 Black UNC faculty members (September 7, 2018). "To reinstall Silent Sam would 'herald for the nation and for the world that UNC is not a welcoming place for black people'". Washington Post. ^ Lang, Hannah (September 18, 2018). "Letter written by Black faculty on Silent Sam receives support". Daily Tar Heel. ^ Stancill, Jane (October 12, 2018). "Silent Sam should not return to UNC campus, faculty council says". News & Observer. ^ a b Hood, John (September 26, 2018). "Undecided lean right on key issues". Carolina Journal. ^ "North Carolina Statewide General Election Poll Crosstabs September 4 – 7, 2018" (PDF). Harper Polling. September 7, 2018. Retrieved October 4, 2018. ^ Travis, Kari (September 4, 2018). "Silent Sam may speak loudly in national conversation on free speech". Carolina Journal. Rubin, Jr., Louis D. (Winter 2001). "Of Statuary, Symbolism, and Sam". Callaloo. 24 (1). pp. 160–161. Knight, Michael Muhammad (January 29, 2015). "The University of North Carolina's Silent Sam Statue Represents a Legacy of White Supremacy". Vice. Retrieved September 25, 2018. Wahlers, Kasi E. (2016). "North Carolina's Heritage Protection Act: Cementing Confederate Monuments in North Carolina's Landscape". North Carolina Law Review. 94 (6–8). p. 2176. Patel, Vimal (December 3, 2017). "Chapel Hill's New Civil War". Chronicle of Higher Education (subscription required). Calfas, Jennifer (August 21, 2018). "Why UNC's Toppled 'Silent Sam' Statue Has Been a Focus Point of Protest for Decades". Time. Cirillo, Frank J. (August 22, 2018). "Why 'Silent Sam' had to go". Washington Post. We can debate the propriety of how the statue got toppled, but not whether it should have gone. CrimethInc. Ex-Workers Collective (August 24, 2018). "Accounts from the Fall of Silent Sam". It's Going Down. Webb, Nancy (August 27, 2018). "NC Influencers weigh in on Confederate monuments". News & Observer. Molina, Camila (August 27, 2018). "Move Confederate monuments from public places, NC Influencers say". News & Observer. Patel, Vimal (August 29, 2018). "Silent Sam Was Toppled. Yet He Still Looms Over Campus". Chronicle of Higher Education. Beorn, Waitman Wade (September 11, 2018). "U.S. put its Silent Sams on pedestals. Germany honored not the defeated but the victims". Washington Post. Patel, Vimal (September 25, 2018). "UNC's Chancellor Is a Consensus Builder. Silent Sam Is Her Greatest Test". Chronicle of Higher Education. Stancill, Jane (December 6, 2018). "Put Silent Sam back. Send it to a farm. Dump it in a hog lagoon. — UNC's mail ran the gamut". News & Observer. Barnett, Ned (January 15, 2019). "Carol Folt goes out frustrated, angry and right". News & Observer. Stancill, Jane (January 18, 2019). "In the end, Silent Sam's fate and Carol Folt's future were intertwined". News & Observer. Wikimedia Commons has media related to Silent Sam.